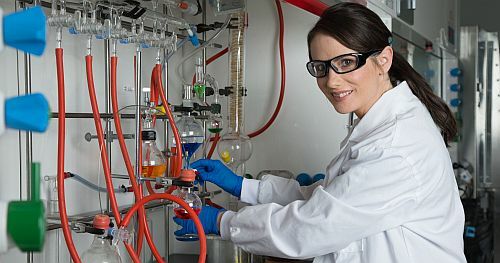 A young scientist who is using the Australian Synchrotron to help her pursue a vision for a new manufacturing industry has been awarded a $25,000 L’Oréal For Women in Science Fellowship. 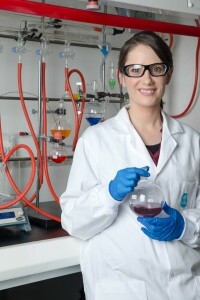 CSIRO materials scientist and synchrotron user Dr Cara Doherty is developing new technologies that could transform water filters, batteries and medical sensors, and clean up carbon emissions. Cara works with crystals that are packed with… nothing. They’re highly porous sponges – down to a molecular level – and can be customised to absorb almost any molecule. The crystals are metal-organic frameworks (MOFs), which consist of an array of metal ions linked by organic molecules in a vast, open structure. MOFs can be tailored by varying the metal ions or organic molecules, but there are major challenges in creating the 3D devices required for practical, commercial applications. At CSIRO, Cara works with Paolo Falcaro in the Materials for Energy, Water and Environment group headed by Anita Hill. Cara uses antimatter (positrons) and synchrotron x-rays to measure the crystals and their properties before using her patented technique to imprint useful shapes for devices. She combines data from positron annihilation lifetime spectroscopy (PALS) with information from synchrotron techniques such as small angle x-ray scattering (SAXS) and x-ray powder diffraction. Cara received her L’Oréal award on 12 August 2014, along with two other fellowship winners. She plans to use her Fellowship to investigate developing 3D structures for a smart water filter that uses MOFs to trap and remove chemical and biological pollutants from non-potable water.